Computers surround us. They are in our homes, our work places, our cars and we even carry them about in our pockets. Computers are such an integral part of 21st century life that it is hard to imagine a time when a college installing a computer rated any sort of media attention. 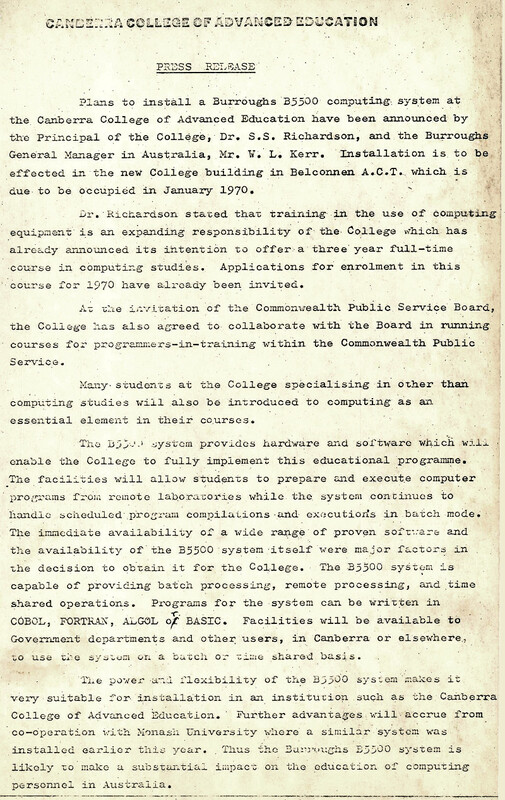 Yet attention is precisely what happened in 1970 when the brand new Canberra College of Advanced Education (CCAE) took delivery of a Burroughs B5500 Computer. This was an era when the first form of home computers was solely the domain of keen hobbyists and technicians. Most commercial computers in 1970 required a whole room to house them, but they could not compete with the average mobile device of today. To meet the public and private sectors' growing demands for computer programmers and operators, the CCAE established its College of Computer Studies. This College and its state of the art Burroughs B5500 placed it at the forefront of computer education in Australia in 1970. 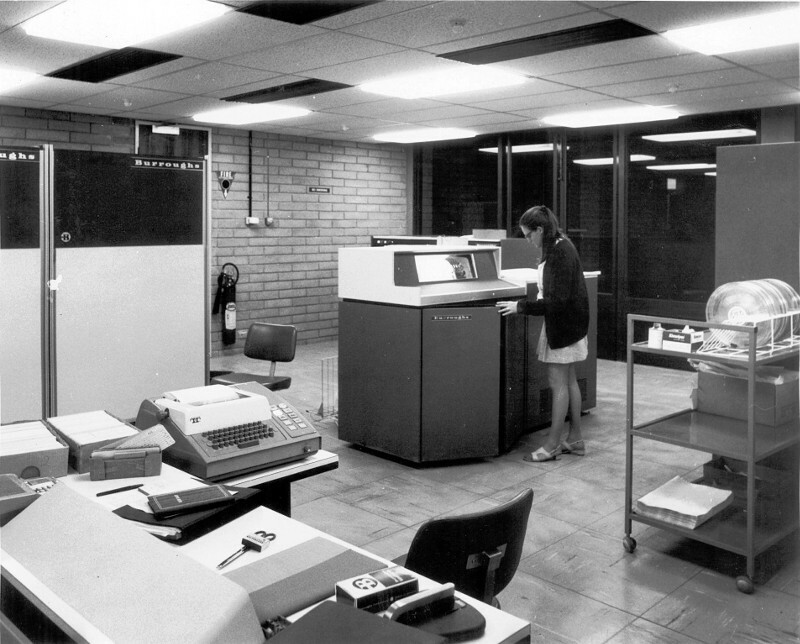 Files on the CCAE's Burroughs B5500 Computer are ArchivesACT's Find of the Month. "A Significant New Approach to Tertiary Education"
During the 1950s, the Federal Government, recognising the "deplorable state of university accommodation, facilities and funding" , established a Commission to oversee future funding of Australia's universities. In 1962, the Australian Universities Commission's chairman, Sir Leslie Martin, saw the need for more tertiary institutions with a strong vocational bias and urged for "the development of the non-university tertiary stream." "This is one of the most satisfying tasks that I could imagine myself undertaking, because the unveiling of this plaque is an indication that we are really moving in building the first Canberra College of Advanced Education and that College represents a significant new approach to tertiary education." The College of Advanced Education (CCAE) became the University of Canberra (UC) in 1990. Since 1970, over 75,000 students have graduated from the CCAE and UC. The CCAE's computer courses would be the first available in Canberra. Up until this time, only the larger interstate universities offered such courses. The Australian National University (ANU), although it ran its own computer centre, did not offer computing courses until 1972. In 1969, the CCAE set about selecting and acquiring a computer to support its proposed computing courses, which were to commence in 1970. The CCAE had positioned the College of Computing Studies within the School of Administrative Studies. This placement was to ensure that the use of the computer was not limited to "studies with a mathematical bias." An analysis by the CCAE highlighted that in computing courses offered by Australian universities "computing is subordinate to another discipline." The College believed that many of these courses concentrated on academic research making "numerical analysis and mathematical programming" dominant and did little more than equip students with the computing skills applicable to their main field of study. It also believed that the wider computing courses on offer were mainly theoretical, with graduates requiring "further practical computer training before they are of value to their organisation." The CCAE believed that for its Computing Studies programme to succeed, courses must include considerable emphasis on practical work with computers, and access to modern computer hardware and the full range of major contemporary software. It also wanted a course structure that supported the "interdisciplinary approach of the College." By offering students outside of Computing Studies the computing skills applicable to their specialisation, computers would become a normal part of their academic work. By 1969, the CCAE had formulated an "unusually comprehensive course structure supported at all levels by extensive practical work." The courses ranged from algorithms and procedural notation (the essential prerequisites for all computing courses), programming and program design, hardware design, information systems design, data processing and information retrieval. There was even a course for the social sciences called "The computer in society: the social impact of the computer, and the computer industry as a social phenomenon." "There is little doubt now remaining that any tertiary education institution which has pretensions to academic respectability must have a reasonably fast computer of adequate processing capacity which is also suitable for teaching." 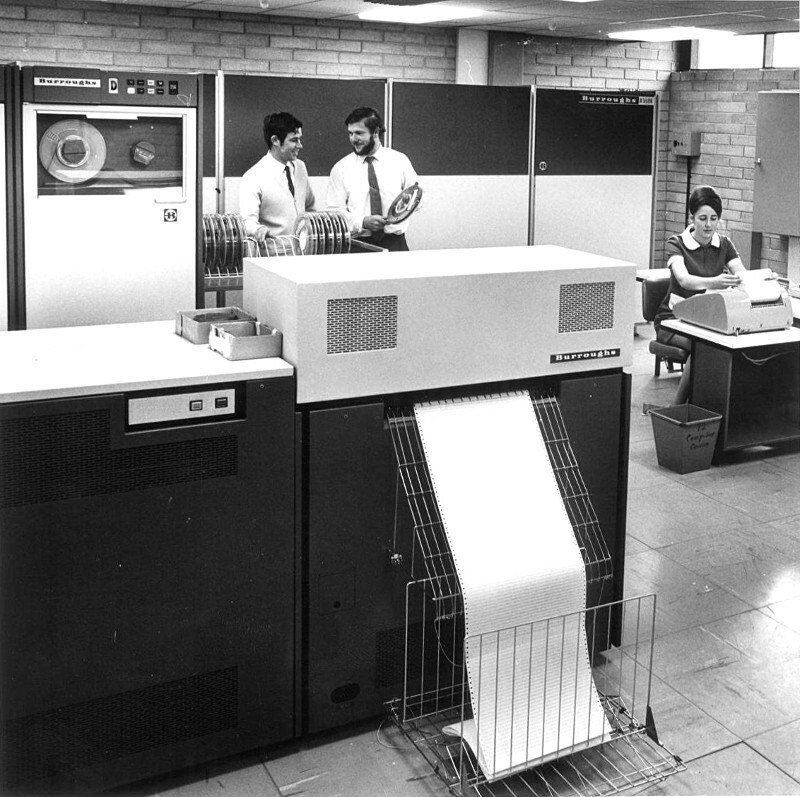 After evaluating a number of large-scale computer installations, the CCAE selected the Burroughs B5500 computer, one of the most advanced mainframe computers available at that time. Its modular design allowed a high degree of flexibility for a wide range of industry and academic uses. The College estimated it would need an area of 255m2 to house the B5500 system, comprised of two fixed discs, eight magnetic tape units and ten teletype terminals, which Burroughs would install and maintain. 19 million characters of disk store (equivalent to an 18Mb hard drive). The B5500 could run software in a number of different programming languages including Algol, Basic, Cobol 61 and Fortran, allowing students to gain knowledge and experience in these languages. The main method of inputting software and data at that time was via punched cards. A programmer would create two sets of punched cards, one set for the program and a second set for the data to be processed. It was also possible to store software and data on magnetic tape. Despite these limitations, the B5500 was capable of multi-tasking and could run up to 16 processes at the same time, including multiple terminal users and batch processing of data. This made it ideal for both teaching and CCAE's administrative data management. "Remote Control Terminals and Other Gadgetry "
On 22nd December 1969, the Canberra Times ran the front-page article, "Canberra college to have computer." Principal Dr S.S. Richardson announced that after four months of negotiations, the college had received approval to lease the B5500 computer system. He stated, "This is an installation of some consequence" that would "allow the college to operate remote control terminals and other gadgetry." Dr Richardson continued; "It will be the most powerful computer system installed in any college of advanced education in Australia. It is equivalent to the machine at Monash University" and would be used for "training programmes involving all college students." Due to the high outright cost, the CCAE planned to lease the B5500 from the Burroughs Corporation over three years for a total of $250,000. The estimated recurrent costs for staffing, ancillaries, and consumables such as punched cards and magnetic tapes would amount to $206,820 during the same period. To offset the costs, Burroughs would have sole access to the B5500 for up to 2 hours per day as well as some time-shared access. The CCAE also decided that it would sub-let time on the computer to public and private sector organisations, a scheme it referred to as "CUBE" (The Common Use of Burroughs Equipment). The estimated total income over three years was $377,000. However, it was this plan that resulted in unforeseen delays in the computer's delivery in early 1970. Normally computers leased by Commonwealth departments entered Australia duty free, as their use was non-commercial. However, the CCAE's plan to derive commercial income from its computer meant that Customs tariffs applied - a cost not factored into the College's budget. 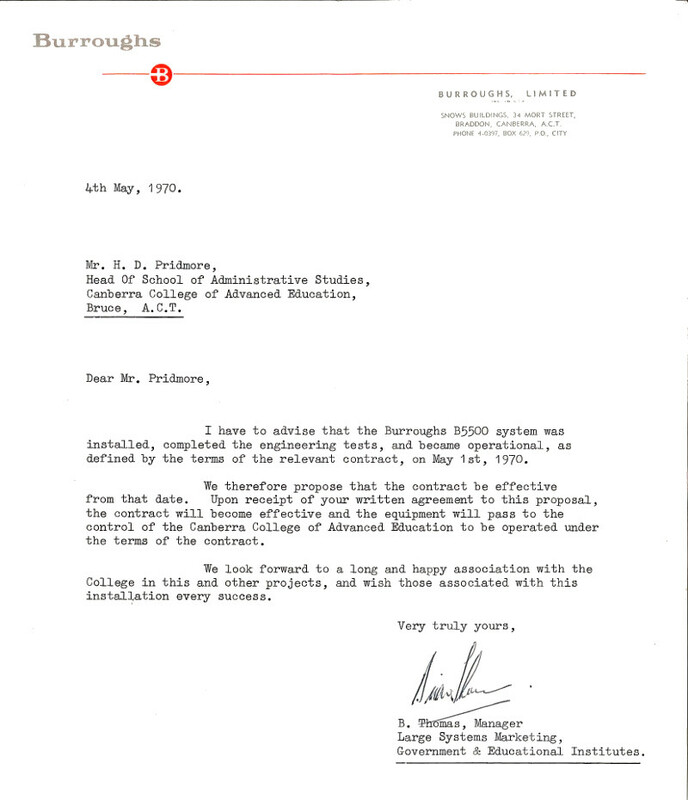 When the B5500 arrived in Sydney in February 1970, Customs requested a payment of $66,000 import duties before it would release it to the College. Computing classes were due to start within months, so the CCAE could ill afford any delays with installation. With the assistance of the Deputy Comptroller-General of Customs, a temporary solution was found. Pending a final decision on the payment of duties, Customs would permit the licensing of the CCAE as a "project warehouse." This allowed Burroughs to begin installing and testing the B5500 at the CCAE in March 1970, completing work by the 1st of May. Full use of the B5500 began in July 1970 after Burroughs paid the customs duties on behalf of the College. The Director, who was responsible for the day-to-day management of the centre and liaising with its various users. A Systems Programmer, who ensured the integration of systems being implemented with those already in service. An Applications Programmer/Analyst and a Programmer, who analysed, designed and implemented systems for use by the CCAE. Four Operators and up to four Data Preparation staff. While the photos on this page show CCAE staff in regular clothes, it was common practice for computer centre staff to dress in accordance with their duties. Computer technicians, who maintained the hardware, would usually wear grey or blue dustcoats, while programmers wore white dustcoats. This made it easier for visitors to a computer centre to identify the correct person to approach when they had either hardware- or software-related questions. When the Canberra College of Advanced Education founders decided to include computing as a normal part a student's academic work, had they foreseen a time when computers would become a "normal part" of everyone's daily life? The timing for the creation of the CCAE computer courses appeared to arrive at a fortuitous time as both the public and private sectors had increasing demands for skilled computer staff. The College's forward-thinking approach in using the Burroughs B5500 across the disciplines enabled students to understand how the use of computers could be valuable in their future career path. The Burroughs B5500 only remained in service for two years, replaced with a Burroughs B6700 in November 1972. However, we should not overlook its role in the training of a large numbers of graduates in those early years and establishing the Canberra College of Advanced Education as a pioneer in Computer Studies.